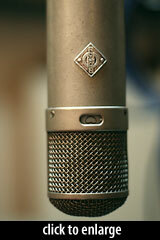 The original U 47, developed by Neumann in the mid-to-late 1940’s, was the first switchable pattern condenser microphone. It has become the most revered vocal microphone in history, and inspired dozens of attempts to recreate its sound. According to Oliver Archut, a prototype U47 was displayed at the Berlin Radio Show (Berliner Funkausstellung) in 1947. Whether that was a functional microphone, or whether its capsule and circuit were similar to what was commercially released, is not known. According to Klaus Heyne of German Masterworks, the first recorded commercial sale of a U47, serial number 72, was in December, 1949. The U 47 could produce either a Cardioid or Omnidirectional pickup pattern. The pattern switch was located on the microphone body, and worked by disabling the polarization voltage to the rear diaphragm. The U-47 did not maintain equal output levels across patterns. This is a characteristic that Neumann engineers sought to improve in later mics, such as the M 49. 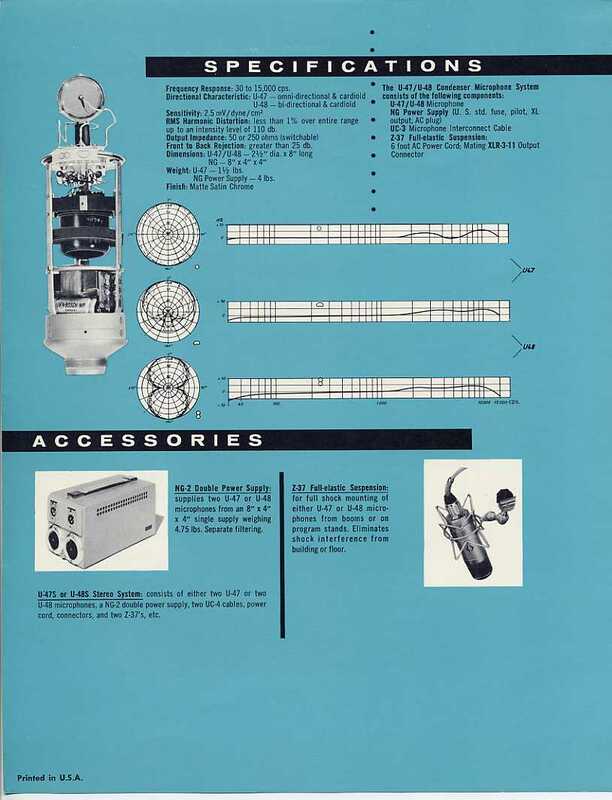 The U-47’s output was 5dB hotter in Cardioid mode than in Omni, because the capsule’s rear diaphragm was simply disconnected in Cardioid mode, avoiding the capacitance losses of having it in the circuit. See the history of the M49 for more information. The original U47 employed a steel-jacketed Telefunken VF14 tube, developed by Telefunken specifically for use in microphones. 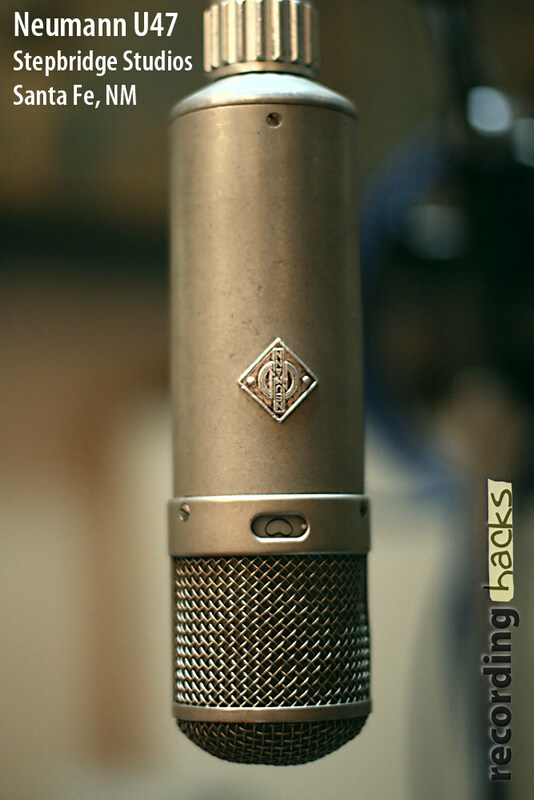 According to Heyne, VF14 production began in 1946; because Telefunken was a 25% owner of Neumann, one could reasonably speculate both that Telefunken engineers played a role in U47 development, and further that the U47 was in simultaneous development by 1946. Non-microphonic VF14 tubes would become hard to find within a few years, leading to changes to the U47 design as well as the introduction of the U47fet, a FET condenser intended to sound the same as its tube-circuit sibling. Early U47 (and U48) mics contained Neumann’s M7 capsule, in which the brass backplate was covered with a thin PVC diaphragm. PVC ages poorly, and as early as 1958 the Neumann factory was using the M7’s successor, a capsule known as the K47/49, which used a metallized polyester diaphragm. The K47 capsule used a single, shared backplate, which caused tensioning challenges, in that both diaphragms would have to be tuned identically to produce balanced Figure-of-8 or Omni patterns. In the original German-language Neumann documentation for the U47 and similar mics, the term “Niere” — literally “kidney” — is used to denote the Cardioid pattern. The term “Kugel,” which translates to “ball,” indicates Omnidirectional. There were about 5000 [U-47s] made, about 3200 long bodies and the rest short. People say it’s gotta be a long body to be any good. False. They’re exactly the same microphone inside. The mic went through three revisions. They started off with a very large transformer/capacitor package. If you pull the covers off you won’t believe; they’re packed. There’s no room for anything in there. If you take exactly the same mic that’s five or six years younger, take the shell off — you’ll wonder where the mic went. According to Andreas Grosser, at least 5 different models of output transformer were used within the U 47. Four of them were called the BV-08, despite differences in mounting, appearance, and construction. 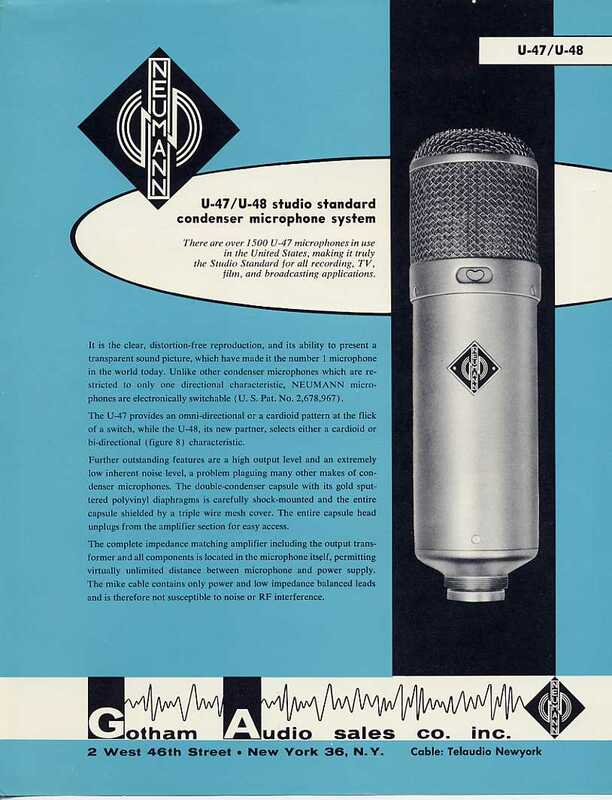 The U47 was manufactured by Neumann, but initially distributed by Telefunken. Therefore, many early U47s bear the Telefunken logo. Neumann took over distribution in the 1950s; the mics distributed by Neumann bear a Neumann logo. 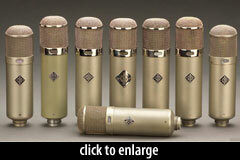 The Neumann U 47 is also known as: U47. The mic was released in 1947.